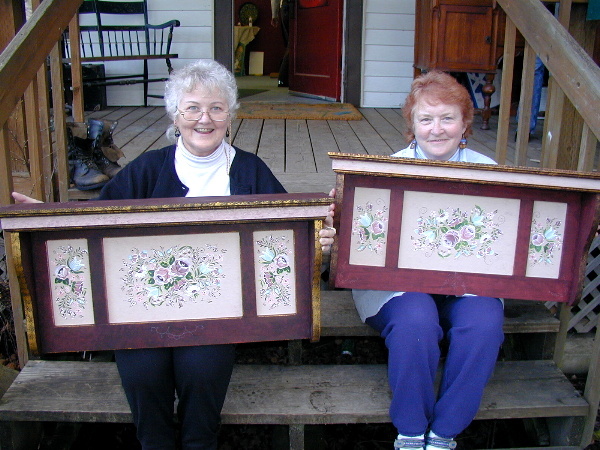 Beautiful Oregon painters worked on two large pieces for four days and almost finished both! 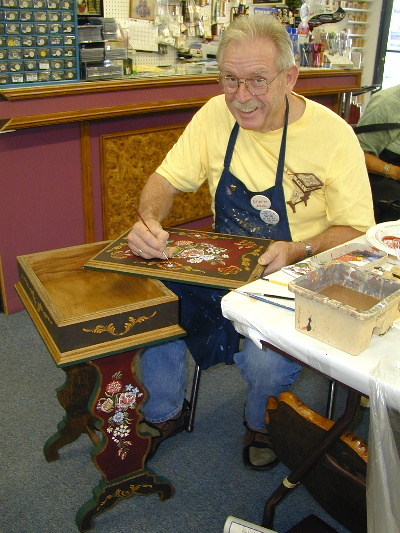 The first two days we painted the Bavarian Bouquet Chest. 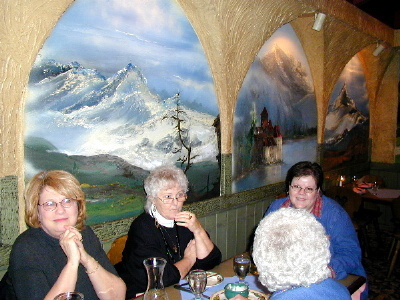 Renate and Barbara painted large shelves instead. 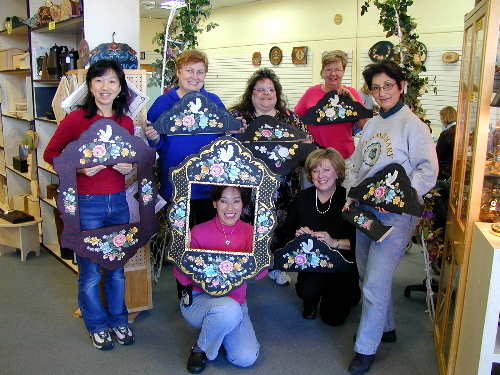 Then we painted the colorful Black Forest Mirror Frame. After that, we were ready to party! 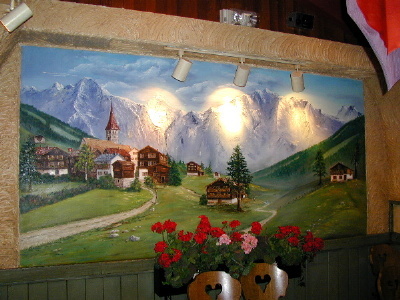 Party time at the beautiful German restaurant Rheinländer - a must for everyone visiting the area! 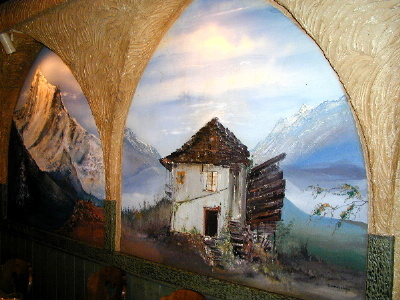 Featured are beautiful murals of the Old Country painted on many of the walls and terrific German food! We decided that all future painting parties should be held in the wonderful Alpine Room complete with singing waiter and strolling musician! 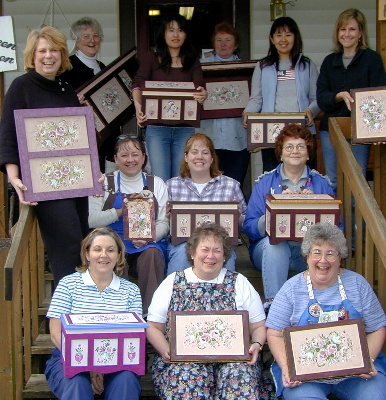 Lovely, industrious ladies (and a token man!) 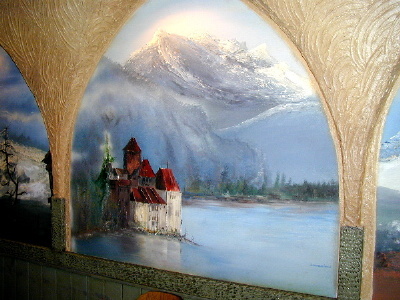 painted for four days and most finished two painted pieces: the Bavarian Door Crown and the Austrian Tray. 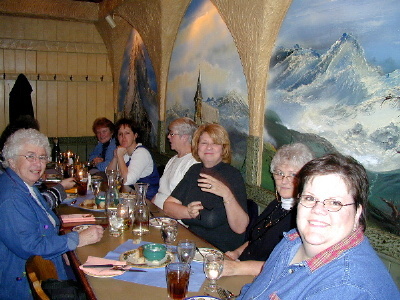 This is a wonderful chapter of fun-loving folks and it was great to see Annette Stark again after twenty-plus years! You all keep up the good work! 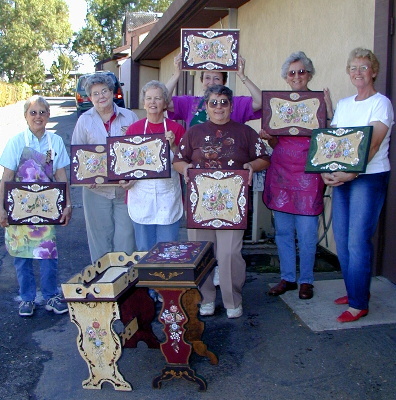 Although these photos were taken a little early, by the end of three days, these hardworking folks had finished all the surfaces of their Chest-Table! We had lots of fun painting together and everyone was happy that this large piece would not end up in their "unfinished pile"! Good job, folks - I'm proud of you! 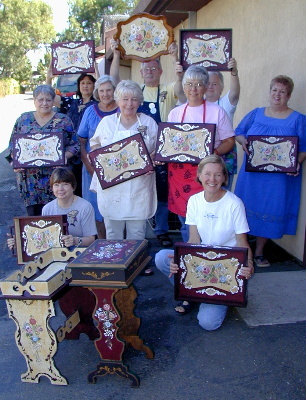 A very industrious class worked for three days and almost everyone finished their Bavarian Chest-Table! 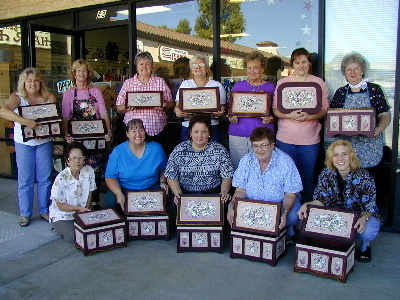 A few really fast painters finished other pieces as well and congratulations to Jeanie who painted TWO tables! 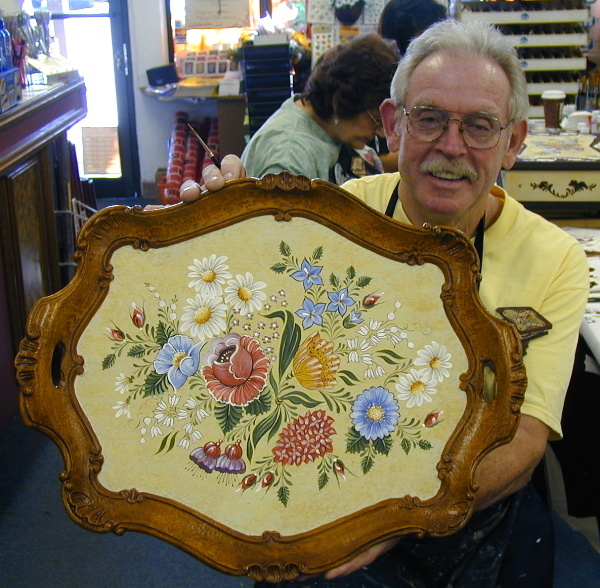 There were beautiful color changes and some lovely variations to the design (see below). 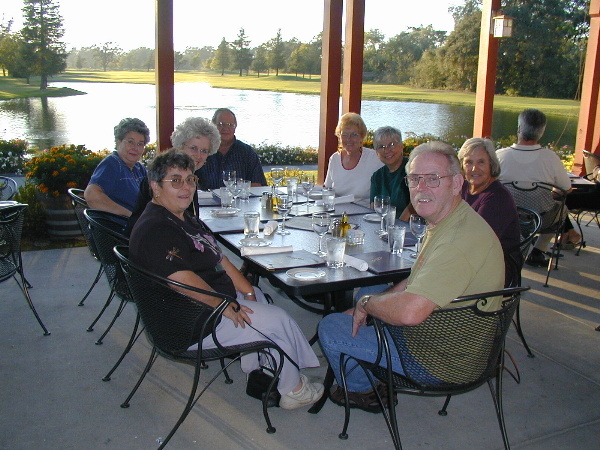 Never ones to miss a meal, we had fun dining at a beautiful country club one evening! 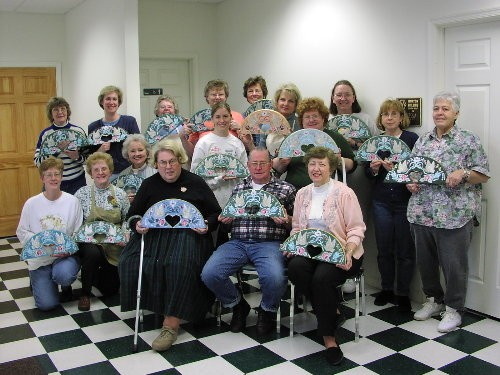 A wonderful group of ladies painted the Double Scalloped Clock (EVERYONE finished in class!) 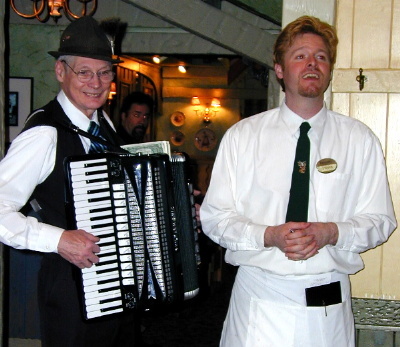 and the Bavarian Bouquet Chest. 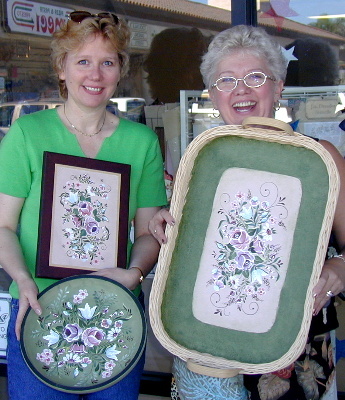 Chris and Karen painted a lid, a bowl and a tray instead. 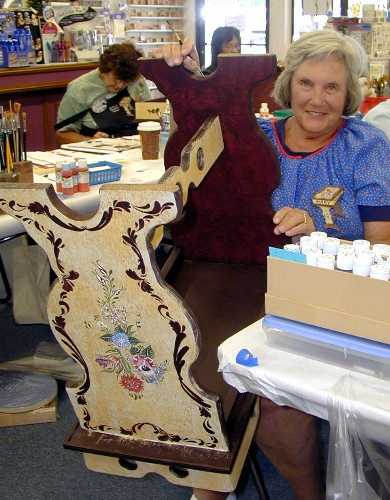 Karmen impressed everyone by using a beautiful Delta Background Stencil over the Kleister on her chest. What a great look! We all want to try that technique on a project sometime. Keep up the good work in sunny southern California! 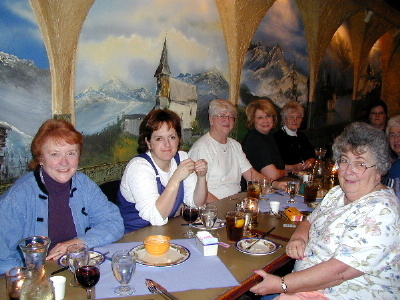 We had a wonderful class of folks for the Beginning Bavarian Folk Art Weekend. 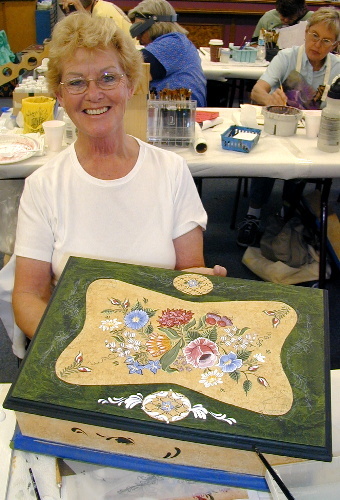 They all worked very hard, improved their strokework and painted four lovely pieces. 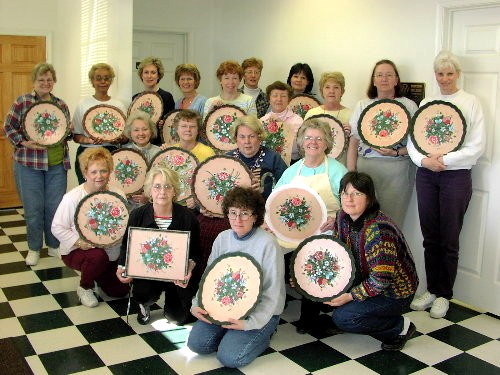 It's the first time that everyone has completely finished all of their pieces (except varnishing) in the Beginning class! Good job folks! Now get busy on those Christmas presents! 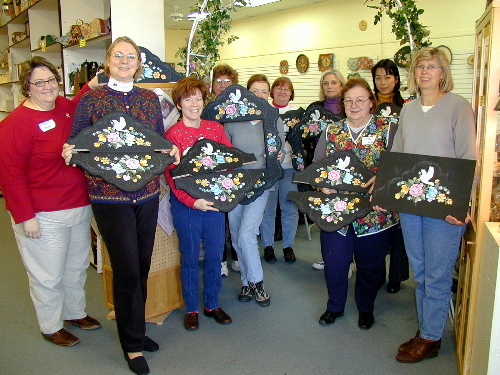 Braving snow and ice and long distance travel for some, a lovely group of industrious ladies painted the colorful Black Forest Mirror Frame. 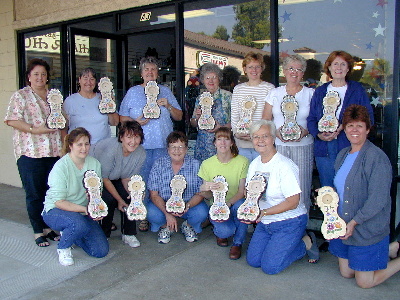 Bobbie took the honors for the first completed frame in class but almost everyone went home with only the border strokes and dots left to finish. A terrific job was done and great endurance to the end of a lot of linework was displayed by all!